I will teach you a little bit about Tibetan Buddhism. I am a Buddhist and my whole way of training is according to the Buddhist teachings called the Buddhadharma. I speak from my own experience and feel that no one has the right to impose his or her beliefs on another person. I will not propose to you that my way is best. If you find something that is suitable for you, then you can investigate these ideas yourself. If you find that they are of no use, then you can discard them. The decision is up to you. Two of the most important principles of the path are bodhicitta and renunciation. Bodhicitta is the foundation of the Great Vehicle of the Mahāyāna; while renunciation is the foundation of the Basic Vehicle of the Hīnayāna. Bodhicitta has a very profound meaning. The essence of bodhicitta is to have a good, kind heart that wishes to help others when one is able and to refrain from causing them harm. If you were standing on a beach and someone was drowning, if you were a good swimmer, you would help them. But, if you don’t know how to swim, at least, you wouldn’t throw rocks on their head! Are the three vital supports for progressing on the path of liberation. There are two levels of bodhicitta called absolute bodhicitta and relative bodhicitta. Absolute Bodhicitta is the realization that the ultimate nature of all phenomena is emptiness. To realize this, we need to cultivate two types of relative bodhicitta called aspiration bodhicitta and application bodhicitta. Aspiration bodhicitta is wishing that all people be free from the causes of suffering and to have the causes of happiness. It is a state of mind that does not include compassionate activities. Application bodhicitta is performing actions that bring benefit to others; you really do something to help the people that you were thinking about when you were practicing aspiration bodhicitta. How do you practice these? You practice aspiration bodhicitta by meditating on the four Immeasurables and you practice application bodhicitta by putting into action the six transcendent perfections. The four immeasurables are equanimity, love, compassion, and joy. The six transcendent perfections are generosity, discipline, patience, diligence, meditative concentration, and wisdom. First, we should develop immeasurable equanimity. If we do not do this, then whatever love, compassion, and sympathetic joy we develop will be one-sided and not equally directed towards all beings. So, it is important to start by meditating on equanimity. Equanimity means giving up our hatred of enemies and our attachment towards friends. In all my lives, may I never harm another sentient being and may I always help each and every one of them. Immeasurable compassion means wishing all sentient beings to be free from suffering and the causes of suffering. When you first meditate on compassion, it is important to focus on the suffering of just one person. Then slowly train yourself step-by-step to include more suffering beings in your meditation. Immeasurable joy means wishing that people who have happiness, good health, and good things, continue to have these wonderful qualities and that these qualities continue to grow for them. The meaning of sympathetic joy is to have a mind that is free from jealousy. This is a short introduction to the four immeasurables that are the foundation of training in aspiration bodhicitta. After bodhicitta, the second most important principle is renunciation. To understand renunciation you must first know what saṃsāra is. It is depicted by the wheel of life. Just as a wheel goes around continually with no beginning and no end, the wheel of life depicts the endless samsaric cycle of existence. As long as you wander in saṃsāra, you will continue to experience suffering. Therefore, you need to develop renunciation to break free from endless suffering. Renunciation is difficult for some non-Buddhists because they do not recognize that saṃsāra is suffering. For instance, when you buy something new, like a computer, you are very excited about the purchase. However, sooner or later, something will happen to cause you to have less satisfaction with your laptop. Your computer becomes outdated, you get a scratch on the screen, or you spill your tea on the keypad. The suffering of saṃsāra occurs because of changes like this due to impermanence. There is no permanent, lasting happiness in saṃsāra, so you should try to cultivate the renunciation and apply it, along with bodhicitta, in your daily life. 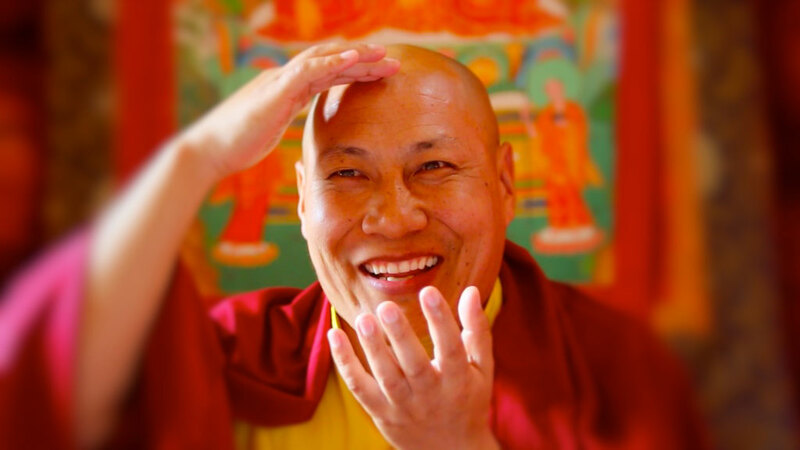 One time in Tibet, Patrul Rinpoche was teaching an important meditation about compassion. There was a monk who attended his teaching. Actually this monk was full of pride and he told Patrul Rinpoche that it would not be a problem for him to meditate on compassion. The great master responded that he would know how much compassion he had when he met a great enemy. One day this monk was seated with a very good posture meditating near a stūpa where Patrul Rinpoche came to circumambulate; walking around like an ordinary person. Patrul Rinpoche held his hands in prayer and asked the monk very politely what are you meditating on? The monk didn’t look to see who was talking to him and said that he was meditating on compassion. Patrul Rinpoch replied that that was wonderful and continued on his way circling around the stūpa. The same scenario happened three times. Then the monk got very angry and demanded Patrul Rinpoche to tell him why he kept pestering him with the same questions. The monk opened his eyes to see that it was Patrul Rinpoche who was asking him the questions. Then the monk was very embarrassed and he apologized to Patrul Rinpoche for not meditating on compassion very well. It is not very easy to meditate on compassion well. If we really do not have genuine compassion, then the compassion we feel is usually mixed with attachment. For instance, when we meditate on compassion and think about our relatives, this is not genuine compassion because you already love and are attached to these people. We cannot have genuine compassion until we can have compassion for all sentient beings. However, do not worry, because in reality we have the root of compassion within us and we need to continue to develop it this way. The compassionate mind has the nature of wishing that all sentient beings be free of suffering. You should put yourself in the place of others and visualize that it is you who is suffering. You will come to an understanding of how that suffering feels. You will also gradually come to see all sentient beings as equal, with no difference between you and them. Then you will not have the desire to harm others. You can exchange yourself for the animals that are slaughtered to feed human beings. The Buddha said that if you eat meat, then it is more difficult to cultivate compassion and bodhicitta. If you are thinking about eliminating meat from your diet, then every day eat a little bit less and less than the day before. You will be able to stop eating it completely soon after that. Happiness does not arise from being self-centered; happiness arises from taking care of others. If you look at the difference between the Buddha and an ordinary being it is easy to understand. The Buddha worked for the benefit of other sentient beings, achieved omniscience, and has the capacity to benefit all sentient beings. Ordinary sentient beings focus only on their own well-being and have not achieved liberation (nirvāṇa) and are still in the cycle of existence (saṃsāra). I don’t know how many people understand what is the difference between saṃsāra and nirvāṇa. The difference is just training the mind outwardly and inwardly. To reach nirvāṇa we must use mind training to look inwardly to recognize the true nature of mind. On the other hand, saṃsāra is also mind training, but one that looks outwardly and causes one to not to recognize the true nature of mind. In saṃsāra, even though we want to have happiness, we run away from the true causes of genuine happiness. The great Indian master Śāntideva says that all the suffering in the world arises because we are self-centered and wish only for our own personal happiness. There are many reasons to take care of ourselves and, of course, you cannot completely ignore yourself. But, we must know how to take care of ourselves in an intelligent way. It means that we do things in a harmonious way and help each other in a mutually advantageous manner. Right now we do things like killing other beings for our own interests or we find happiness in other people or animal’s unfortunate circumstances, but that is not intelligent. It is important to know that this precious human life is very difficult to obtain. Without a human life, it is not possible to find the Dharma. We must have all of our senses working (eyes, ears, nose, smell, touch, and taste). If we do not, it is much more difficult to practice the Dharma. For instance, if we were blind, we would not be able to read the teachings. If we were deaf, we would not be able to hear them. We need to lead our lives in a positive way. If our lives are dominated by negative actions, for example, if we are hunters, thieves, or spend our lives fighting wars that naturally leads in the opposite direction from the positive conditions needed for the Dharma. Why is it precious? Because by using this human birth enlightenment can be achieved in this very lifetime. That is what we call a precious human birth. To practice the real, authentic Dharma, it is absolutely necessary to be a human being. Because we have been born human beings, we have been given many advantages. At all times you should carefully examine whether or not you have all the qualities of the freedoms and advantages of this precious human birth. Sometimes there are circumstances that prevent a person from realizing the freedoms and advantages of the precious human life; specifically the negative emotions, such as hatred for enemies, infatuation with friends and relatives, and ignorance of the nature of reality. When these are very strong, a person may wish that they could practice the Dharma, but because these emotions control their mind most of the time, it prevents them from ever accomplishing the Dharma properly. For instance, just as the rising sun lights up the whole world, it will not make even the smallest difference to a blind man. And just as the waters of a great lake cannot satisfy the thirst of a traveler arriving at its shore, unless he actually drinks from it, the Dharma of transmission and realization cannot get into your mind by itself. To make your precious human life meaningful, always remember to practice bodhicitta and compassion as much as you can each day. This is so important and you will have no regrets when your life is over. As you know, in Buddhism it is very important to investigate the teacher and the teachings. To examine the teacher in a general way means to check whether or not he or she has all the qualities described in the sūtras and tantras. In particular, it is absolutely necessary that the teacher has bodhicitta. If the guru does, then he or she will do whatever is best for the students. So, before you start any practice, you should take care to check the teacher from whom you are receiving an empowerment, reading transmission, or other instructions. In the beginning, do this by skillfully examining the teacher. In the middle, skillfully follow the teacher. In the end, skillfully follow his realization and action. A student who does this is on an authentic path. Do not go by blind faith, but come to a decision through your own reasoning that the teachings of the Buddha are believable and worthy of following. You do not need to investigate your teacher if you have a karmic connection with him or her from a past life or from this life. In this situation, simply to meet him or her, to hear the teacher’s voice, or even just to hear the teacher’s name can change everything for you immediately. It can move you with such faith that every hair on you body stands on end or it brings tears to your eyes. Ordinary people like us are easily influenced by the people and the circumstances around us. That is why we should always follow a good teacher. If you live and study with a perfect teacher full of good qualities, you will be filled by the essence of those qualities and everything you do will be similar to him or her. It is also important investigate the student. It is necessary that the student should be tolerant, intelligent, and motivated. The student needs to be unbiased toward others, to have the capacity to think critically, and to have an interest to engage in the teachings. From the Buddhist point of view it is completely your choice if you want to practice Buddhism and to follow the Buddha. After making your decision to become a Buddhist, you should follow what the Buddha says depending on whether you are following the Basic Vehicle of the Hīnayāna or the Great Vehicle of the Mahāyāna. It all depends on your motivation that will decide which path you should follow. Three people offer one candle of the same quality to the Buddha. One person’s motivation in offering the candle is to be successful in business and to have a happy life. The second person’s motivation is to escape the suffering of saṃsāra and to achieve liberation for himself. The third person’s motivation in offering the candle is for all sentient beings to have happiness and freedom from suffering. All the candles are the same and the offerings all go to the same Buddha, but they do not lead to the same result. The first person will achieve temporary happiness. The second person will achieve individual liberation according to Basic Vehicle of the Hīnayāna. The third person will achieve buddhahood according to the Great Vehicle of the Mahāyāna. From the Buddhist point of view, your motivation is important as nothing exists outside of your motivation. There are many ways to talk about Buddhism. But you need to think about what kind of personality the person has that you are talking to. For instance, some people do not really like to hear about suffering and some people do not believe in something that they cannot see. The best thing that you can do is to help people with their negative emotions. When they are angry, you should tell them to be patient. Also if they are worried, then you should tell them how to resolve that kind of emotional state. People want to be free of stress and worry. The Buddha said that the mind is the root of all things; all good and bad. Everything comes from our mind, including the bad emotions and afflictions like anger, aggression, and jealousy. So, it is very important to investigate our mind. Everything has causes and conditions; without a cause nothing can happen. We say that everything is dependent on its origins or causes. Even the Buddha himself became awakened through causes and conditions. We do not say he was a Buddha from the beginning without going through a process of change. He was an ordinary being like us and he transformed his mind by training step-by-step on the path and slowly he purified all the obscurations of his mindstream. Everything is impermanent and will change as causes and conditions change. Understand that the Buddha’s teachings are characterized by the principle of the interdependent nature of all things. If you can, teach your family and friends about interdependence to the best of your ability so that they can train their minds and suffer less in this lifetime. Always watch your mind carefully. As ordinary beings, it is impossible not to have thoughts and actions that are motivated by wrong intentions. But if we can recognize the harmful direction immediately, confess it, and vow to not do it again, then we will part from our connection to it. Long ago, there was a story about a Brahmin called Ravi who examined his mind at all times. Whenever bad thoughts arose, he would put aside a black pebble, and whenever a good thought arose, he would put aside a white pebble. At first, all the pebbles he put aside were black. Then, as he persisted in developing antidotes, adopting positive actions, and rejecting negative ones, a time came when his piles of black and white pebbles were equal. In the end, he had only white ones. This is how we should develop positive actions as an antidote with mindfulness and vigilance, and not contaminate ourselves with even the smallest harmful actions. People love to meditate. Sometimes people don’t know actually how to meditate. Sometimes meditation can mean to think about your mind. Sometimes meditation is also done without any thinking. Meditation is about developing your mind and giving up negative emotions. If you do not have experience in Buddhism and do not have any experience with meditating, it is important to relax the mind. Relax both your mind and your body. Do not think about anything. Give your mind a break. This is helpful because all the time we are doing and thinking too much. Buddhism is about working with our mind all of the time. By studying Buddhist philosophy or meditating, you will realize that it is the mind that is the source of what helps or what harms. Body, speech, and mind perform positive and negative actions, but the body and speech are subservient to the mind. The mind is truly the boss. As the mind is the root of all, we need to train our mind. When the time comes to die, our only refuge will be the Dharma. Make the effort to accomplish at least one practice of genuine Dharma. When you are going through the dying process it is important to not feel attached to this life and your worldly belongings. If you are attached to them, then you will not remember to practice. Limit your desires and practice satisfaction. Practicing satisfaction means that you have what you need and that is enough. Freedom from suffering and happiness is possible when we train our minds to be satisfied with a simple life centered around practicing bodhicitta. If you only meditate on śamatha called calm abiding or tranquility meditation, but never meditate on anything else, then this will not help you very much in your life. My teacher told me that calm abiding is an important meditation. However, if you do not know when you will die, then it is very important for you to practice bodhicitta. Without bodhicitta you cannot do any kind of meditation as it provides the best motivation for your practice. Calm abiding meditation is nothing compared to this. Calm abiding does not provide you with any motivation; you just complete it without thinking about anything. For example, say that you have a glass of water with a lot of dirt and particles in it. If you shake it up, it will be very dirty. Then śamatha meditation is like having it calm down when the particles and the mud separate to the bottom. Then the water becomes very clear. Your mind becomes workable. However, the particles and mud still exist as they have not been eliminated. This is like the negative emotions, such as anger and attachment, that are lurking around and will become active again when you are not meditating. So it is very important to practice bodhicitta. Be like a coward who has just found a snake in his lap, jump immediately into action and practice bodhicitta. When you meditate there are two important things to remember: how you start and how you finish. When you meditate begin by correcting your motivation. Tell yourself that you will practice meditation to benefit all the beings in this ocean of saṃsāra. This is the motivation of great compassion called bodhicitta. It is important to have this attitude each time you start your meditation practice. The sublime virtues of existence and peace. Working for the welfare of others on a vast scale! Take birth where it has not arisen. But continue to grow forevermore! Obtain the seven qualities of the upper realms of existence. And have the freedom to practice perfectly. And day and night dedicate myself to the Dharma. May I cross the ocean of conditioned existence in this very life. And never become weary and tired of benefitting others in samsara. May all attain enlightenment together. Today I will do whatever positive actions I can and will do my best to avoid doing anything negative. At night, when you go to sleep, do not just drop off into unconsciousness. Take the time to relax in bed and examine what you did that day that was positive. If you have done something good, be glad and dedicate the merit. If you have done something wrong, you should recognize it and vow never to act that way again. People meditate on Vajrasattva so that they can purify their past negative actions, obscurations, and their habitual tendencies. We need to purify all of these things because they are the main obstacles to growing and developing along the spiritual path to enlightenment. It is very important to diminish our obscurations so that realization can arise. There is really nothing good about our negative actions. But the only good thing is that they can be purified through our practice. From the Buddhist point of view, if you have done many negative actions, or if there have been lots of bad things that you have done in this life, and if you do not work to diminish these bad habits, then it will be the cause of your future suffering. However, even if you work to diminish that negativity, some people will think that you cannot reduce these things and will believe that you will go to the hell realms. But from the Buddhist point of view, it is not like that. Even if you do something very bad, it can be purified. There is a sūtra of a man called Angulimala who killed thousands of people. He took their thumbs and made a mala out of them to wear. After he had done this, the man met the Buddha who taught him. Then he felt regret for his past mistakes and negative actions. He had a lot of diligence and he gained enlightenment despite his negative past. The seven branch offering is part of the Guru Yoga section of the preliminary practices. The first branch is prostration as it is the antidote to pride. For this practice you should visualize yourself multiplied infinitely. At the same time, visualize that all beings in the universe are prostrating with you. For the people who are practicing preliminaries, if you want to do prostrations during all five preliminary sections, that is fine. But the best way to practice prostrations is with Guru Yoga. It is important to remember to connect your body, speech, and mind during prostrations. As you prostrate with your body, you should combine this with your speech by saying the seven-line supplication to Padmasambhava or recite Padmasambhava’s mantra OM AH HUNG VAJRA GURU PADMA SIDDHI HUNG. You should also combine it with your mind by thinking that you are practicing with all sentient beings and that you have a feeling of respect and devotion towards the Buddha. Start your prostration by holding your hands together in the shape of a lotus, with a little space inside where you visualize all of the things that your are offering to the Buddha. Then you place your hands on the top of your head to purify the obscurations of your body, then to your throat to purify the obscurations of your speech, and then to your heart to purify the obscurations of your mind. Then you kneel and touch the floor with your body at the five points: the forehead, the palms of your hands, and your knees. You do this so that you can purify the obscurations of the five poisons and receive the blessings of body, speech, mind, qualities, and activity of the buddhas. The second branch is offering that is the antidote to greed and stinginess. In Buddhism we make offerings to the Buddha. These offerings are usually things like incense, food, water, butter lamps or candles, flowers and so forth. In the preliminaries the offering is done with maṇḍala offering. Visualize that you are offering all of the wealth in the universe that is not owned by anyone. You can accumulate just as much merit by offerings all of these things as you would if they were your own possessions. Never think that you have nothing to offer. During the offering, visualize all the buddhas and bodhisattvas and that all sentient beings are purified of their obscurations. The third branch is confession of harmful actions that is the antidote to negative obscurations. This branch relates to Vajrasattva in the preliminary practices, and you use the second and third powers of regret and promise not to do whatever you are confessing again. One time King Prasenajit invited the Buddha and his followers to eat at his palace every day for four months, during which time he offered them all of his possessions. An old beggar woman who saw this was filled with joy. Through her sincere and perfect rejoicing she created boundless merit and the Buddha knew that. That evening, when it was time to dedicate the merit of the feast, the Buddha dedicated the merit in the name of the old beggar woman. This story is told to show how rejoicing in other’s deeds is very beneficial. The fifth branch is requesting the Buddha to teach by turning the wheel of the Dharma that is the antidote to ignorance. Imagine that you are in the presence of the Buddha, bodhisattvas, teachers, and all of those who do a lot of good things for others. Think about how they have become tired and discouraged because the students are not listening, studying, or meditating on and following the teachings. At this time it is important to request the teachers to continually turn the wheel of the Dharma. The sixth branch is praying that the buddhas and bodhisattvas have a long life so that they can teach the Dharma. The cause of happiness is learning the Dharma and putting it into practice. As we cannot learn the Dharma without our teachers, we request them to remain healthy for a long time to benefit living beings with their wisdom and compassion. The seventh branch is dedicating the merit and it is the most important one. Never forget to say the dedication prayers at the end of any good act, great or small.